Planet Or Not, Icy Pluto To Finally Get Its Day In The Sun : The Two-Way Astronomers kicked Pluto out of the planetary club in 2006 because of its small size. But scientists set to explore the surface Tuesday via a spacecraft's camera say those other guys are just wrong. A portrait of Pluto (right) and its moon Charon in a colorized, composite image made July 11 during the final approach of the New Horizons spacecraft. Astronomers are eager to get a much closer view of the icy world Tuesday. Alice Bowman oversees daily operations for NASA's mission to Pluto. Her language is peppered with technical terms — like "astronomical units" and "aim points." But there's one piece of scientific nomenclature you won't hear coming from Bowman's lips: dwarf planet. "Pluto is a planet," she says. "And that's the way I will always think of it." Pluto was relegated to dwarf planet status in 2006, just months after the spacecraft that Bowman manages, called New Horizons, began its 3 billion-mile journey to pay a visit. 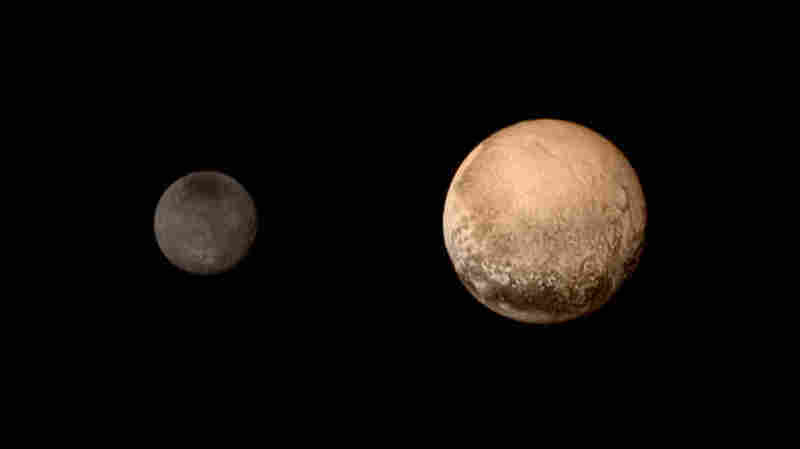 New Horizons will fly past Pluto on Tuesday, sending back detailed images and scientific measurements of the icy world. The change in Pluto's designation came after a vote by members of the International Astronomical Union, the world's leading group of astronomers. At a meeting in Prague, the group adopted a definition called "Resolution 5A," which kicked Pluto out of the planetary club. But some of the scientists working on New Horizons have never fully accepted the change. Alan Stern, the mission's principal investigator, says the reclassification was a knee-jerk reaction to events at the time. In the 1990s, astronomers began detecting planets around other stars. Then in the mid-2000s, they started to find more and more planet-like objects beyond Pluto, at the edge of our solar system. 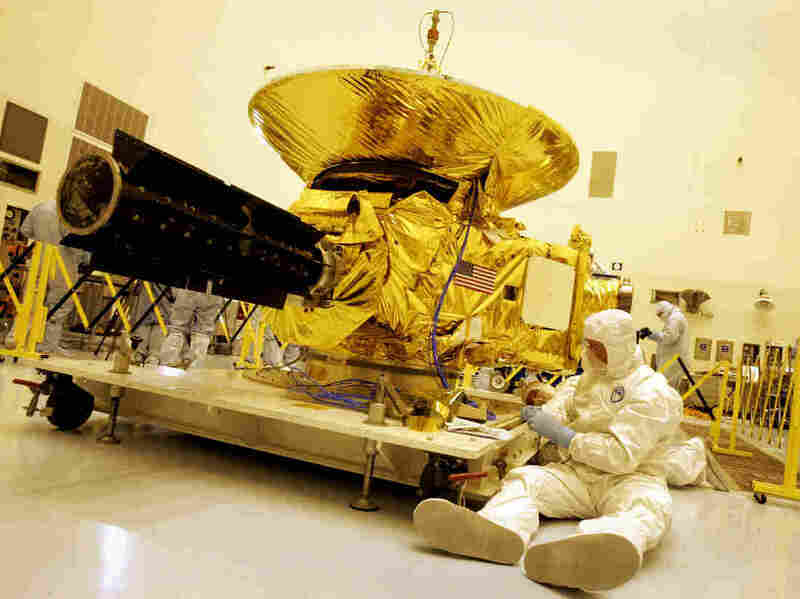 Technicians prepped the New Horizons spacecraft on Nov. 4, 2005, at the Kennedy Space Center in Cape Canaveral, Fla. Fired into space in 2006, the probe is scheduled to finally get close to Pluto on Tuesday. The astronomical union "reacted to the new data that there are many more planets in a rather unscientific way," Stern says, "by trying to legislate what is and isn't a planet — to keep the numbers small." First, it must orbit our star, the sun. Second, a planet has to be round. And third, and maybe most controversial, planets must be big enough that their gravity can clear debris, such as asteroids, out of their path. "That's flawed for a couple of reasons," Stern says. For one thing, Jupiter and Earth both have asteroids in their orbital zones. The other reason Stern hates this rule is that Pluto has a much bigger orbit than any other planet. But the International Astronomical Union is unmoved. "Pluto is a dwarf planet. So be it — it's a classification," says Thierry Montmerle, the group's general secretary. "It's not a demotion or a promotion." He says Pluto clearly doesn't fit with the other planets. "It's a very, very small planet; it's smaller than the moon," he says. Pluto also orbits at a funny angle compared to the other planets. And there are a whole lot of other Pluto-like things cluttering up the outer reaches of the solar system. "You may accept it, or not accept it, but it's there — it's there to last. There's no doubt about that," Montmerle says. But Pluto mission leader Alan Stern still thinks the definition is wrong. All the Pluto-like planets at the edge of our solar system deserve to be called "planet" once again, he says. And if that means school children can no longer memorize them, so be it. It's "so 20th century," Stern says, "to think of planets as something you should be able to name."